2. Cut the pastry into 12 circles with an 8 cm cutter. Line 12 shallow patty pans or mini muffin tins with the pastry. 3. 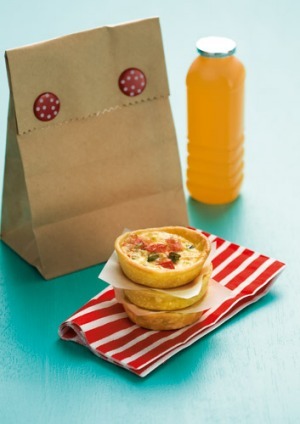 Mix together the tomato, cheese, ham and spring onion and spoon the mixture into the pastry cases. 4. Whisk together the milk and egg. Pour enough into each pastry case to cover the filling. 5. Bake for 15-20 minutes, or until the filling is set and golden. Transfer to a wire rack to cool. Store in the refrigerator in an airtight container for up to two days.